Last Thursday, January 21st, I gave a presentation at the Sun Horizons conference, “Healthcare Integration Through a New Perspective.” The title of my talk was “Identity Management: Securing Information in the HIPAA Environment.” I explored how the complementary functionality of Identity Management and Master Patient Index technologies can enable effective Patient Consent Management, a vital requirement for online health information networks. A copy of my presentation deck is available for download here. A Master Patient Index enables correlation of patient data across multiple repositories. This is essential because patient records are typically help in multiple locations. In other cases, if patient records exist in the same physical data warehouse, they are often logically separated. 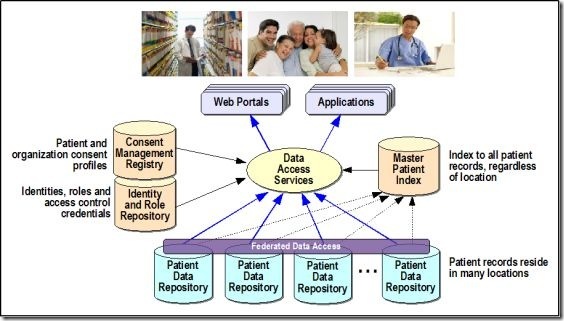 If patient data is located in physically or logically separate locations, Federated data access controlled allows access across domain boundaries without compromising the privacy or integrity of individual patient record repositories. 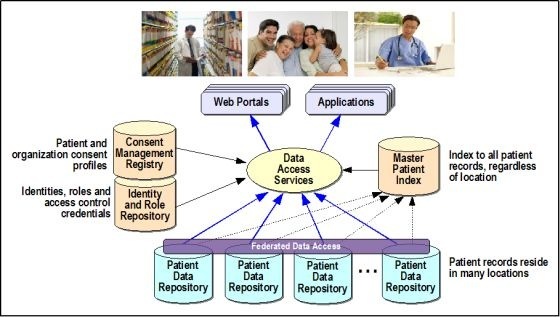 By providing a set of centralized data access services governed by IAM, the Consent Registry and the Master Patient Index, a secure method of patient data access is possible.